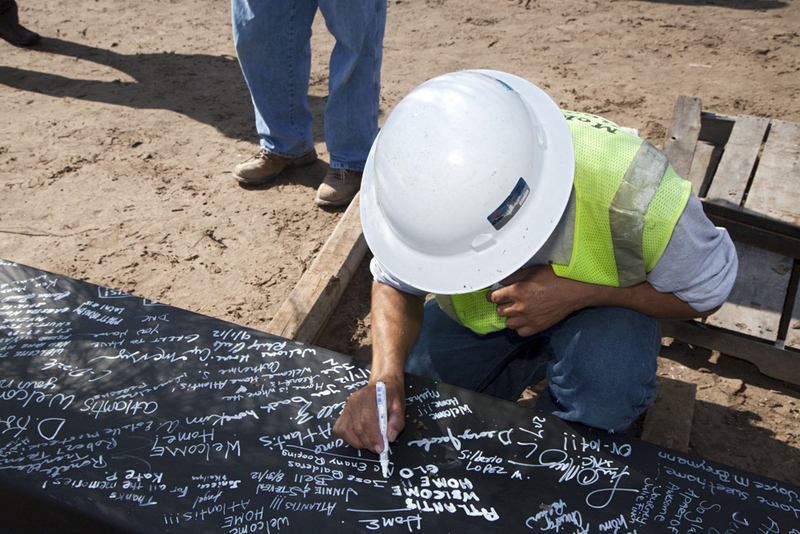 The new home for space shuttle Atlantis was topped out Wednesday with its highest beam in a milestone ceremony marking the continuing construction of a 90,000-square-foot exhibit hall at the Kennedy Space Center Visitor Complex. 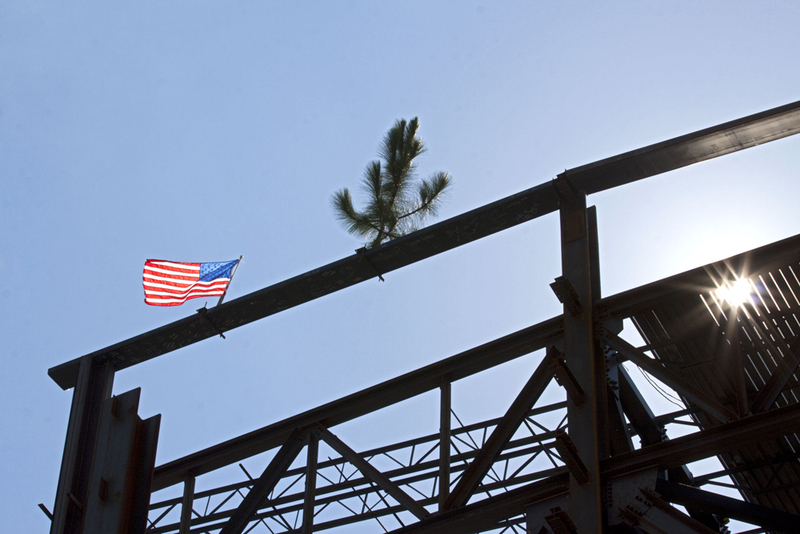 The 38-foot-long, one-ton steel beam was lifted 116 feet off the ground where workers locked it into place. A small tree and American flag were fitted onto the beam, which was signed by hundreds of contractor and NASA employees. Roy Tharpe added his signature at the last moment, continuing a tradition he began in the early 1960s when he signed the top beam of the Vehicle Assembly Building. Construction is far from complete on the structure. Now mostly a framework of steel beams, workers will enclose the space in the next couple of months careful to leave one wall open so Atlantis can be rolled in and the building finished around it. 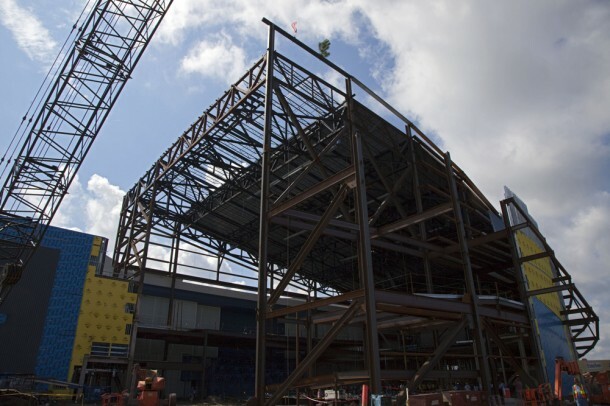 It will take some 1,400 tons of steel to complete the structure. 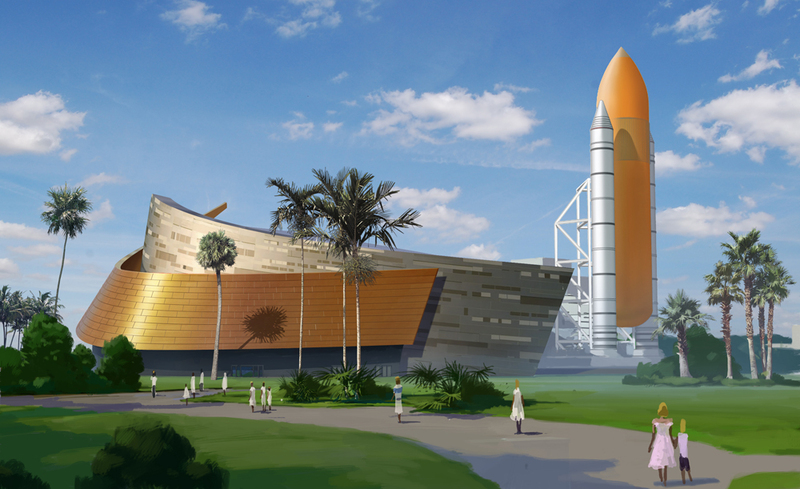 The exhibit is being built by Delaware North, which manages and operates the Kennedy Space Center Visitor Complex for NASA. Tim Macy, director of Project Development for the visitor complex, said the exhibit is scheduled to open during the July Fourth weekend in 2013. Atlantis will be the last shuttle to move out of the operational area at Kennedy. The move will take place Nov. 2, with the shuttle attached to the orbiter transport vehicle, or OTV, that carried the shuttles for years from their processing hangars to the Vehicle Assembly Building. 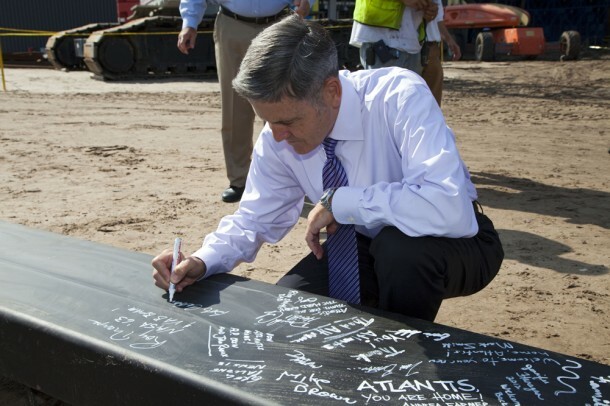 The OTV will take Atlantis on a 9.8-mile journey from the VAB to the headquarters building at Kennedy, then across to the developing Exploration Park for a 3-hour stop before finishing the trip to the visitor complex’s exhibit structure. With the retired orbiter inside, workers will be able to complete the building around the shuttle. The shuttle will be lifted onto a stand and tilted at 43.21 degrees – that number is intentional – with its payload bay doors open. The shuttle will look as it did in space. Sixty-two exhibits will be erected around it, including a full-scale mockup of the Hubble Space Telescope and a full-scale model of a portion of the International Space Station. The exhibits will tell the shuttle program’s history with interactive displays and other features that allow visitors to learn as much as they want about the spacecraft that carried astronauts into space for 30 years. The work to get the shuttles to their new homes is close to wrapping up. Discovery, the most-flown of the shuttle fleet, has been on display at the Smithsonian’s Air and Space Museum for a few months. Endeavour, the youngest of the shuttles, has been outfitted for its Sept. 17 flight atop a modified 747 Shuttle Carrier Aircraft to Los Angeles where it will be put on display at the California Science Center. Enterprise, the prototype shuttle that flew glide tests and was used to test all manner of fixtures and techniques before the first shuttle launch, stands on the flight deck of the Intrepid in New York City as a prominent exhibit at the Intrepid Sea, Air and Space Museum. Eventually, each shuttle will show a unique configuration. Endeavour will be displayed vertically as it was for launch. Atlantis will reveal to visitors a shuttle as it appeared in orbit. Discovery looks like it just landed.